Photo courtesy Jamie Song @jamies_jungle. *(c)2018 by Jen Stearns. All rights reserved. Excerpted from The Inspired Houseplant by permission of Sasquatch Books. 1 of 6 Photo courtesy Jamie Song @jamies_jungle. *(c)2018 by Jen Stearns. All rights reserved. Excerpted from The Inspired Houseplant by permission of Sasquatch Books. A riot of color and texture creates a living wall, carving this sitting area out from a larger loft space. 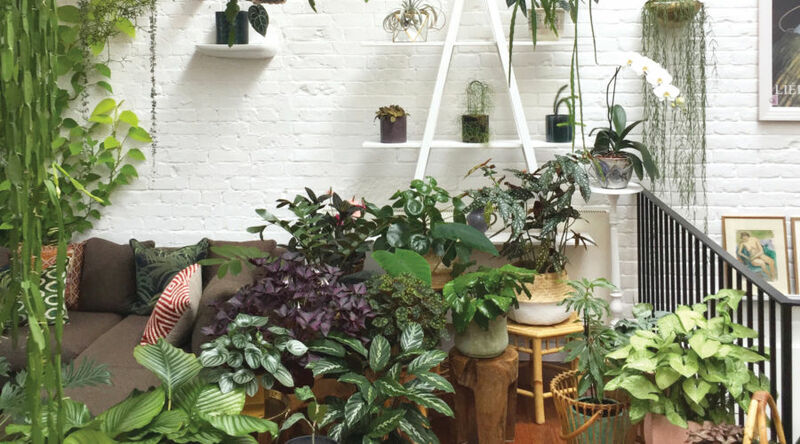 Consider every surface, from floor to wall to ceiling, a potential home for plants of all sizes and growth habits and incorporate different hues, textures, and variegated leaves to pull it all together. Photo courtesy Rich and Sara Combs of the Joshua Tree House. *(c) 2018 by Jen Stearns. All rights reserved. Excerpted from The Inspired Houseplant by permission of Sasquatch Books. 2 of 6 Photo courtesy Rich and Sara Combs of the Joshua Tree House. *(c) 2018 by Jen Stearns. All rights reserved. Excerpted from The Inspired Houseplant by permission of Sasquatch Books. 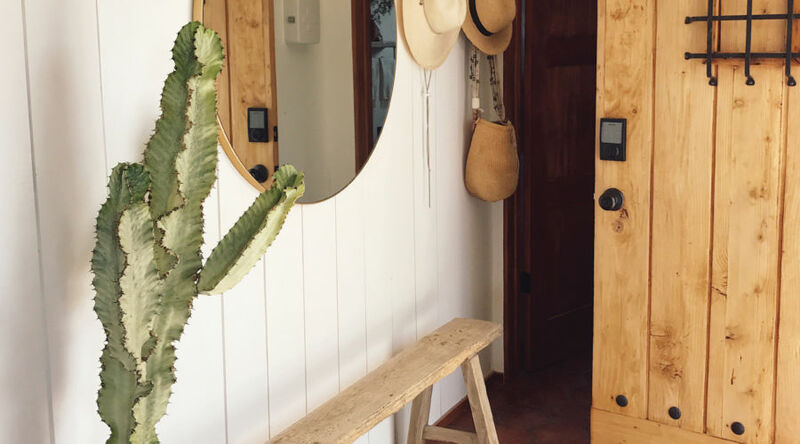 The upright growth habit of this showpiece cactus offers striking juxtaposition to the round mirror, light, and hats in this airy entryway. Get this look by layering natural elements, such as glazed tiles, terra cotta, and wood, and playing with form and shape. Photo Courtesy Christine Kelso @workhardplanthard. *(c) 2018 by Jen Stearns. All rights reserved. Excerpted from The Inspired Houseplant by permission of Sasquatch Books. 3 of 6 Photo Courtesy Christine Kelso @workhardplanthard. *(c) 2018 by Jen Stearns. All rights reserved. Excerpted from The Inspired Houseplant by permission of Sasquatch Books. Bold leaf shapes lend themselves beautifully to a mid-century aesthetic. 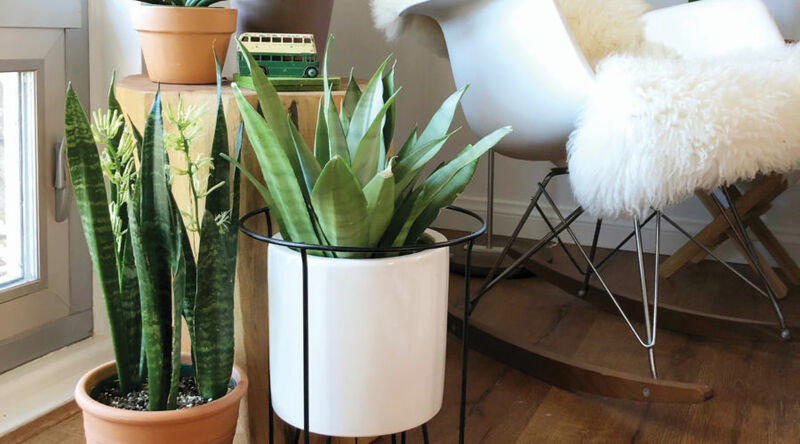 Featured here are the sturdy pillars of snake plant, a conical cactus, and large-leafed philodendron, all set off by the crisp white of the lamp and a luxurious rocker. Photo courtesy Alexandra Gorn. *(c) 2018 by Jen Stearns. All rights reserved. Excerpted from The Inspired Houseplant by permission of Sasquatch Books. 4 of 6 Photo courtesy Alexandra Gorn. *(c) 2018 by Jen Stearns. All rights reserved. Excerpted from The Inspired Houseplant by permission of Sasquatch Books. You needn’t group plants to make them the focal point. Minimalism celebrates the loneliest number—a solitary specimen in a neutral container strikes a perfect pose against a black-and-white background. 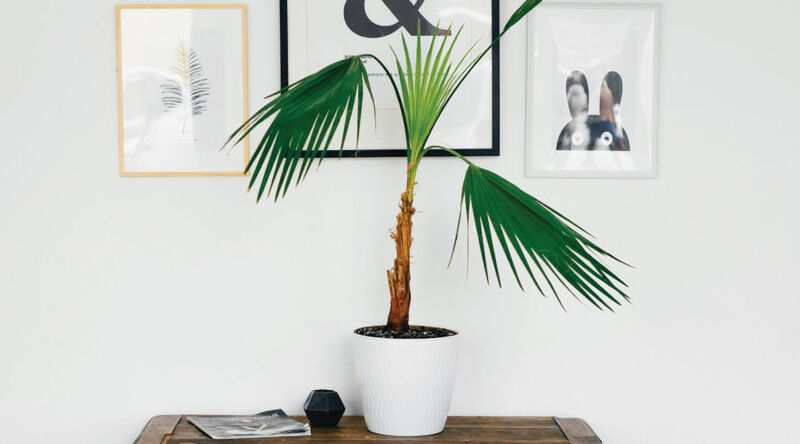 Here, an entryway gets pop from a potted fan palm. 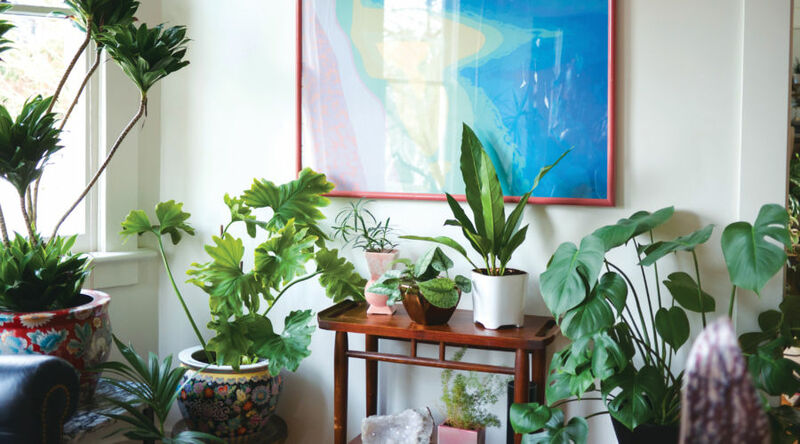 Instead of clustering, choose a single plant with a striking shape or color and let it take a place of honor. Photo courtesy Natasha Sidhu @la_sidhu. *(c) 2018 by Jen Stearns. All rights reserved. Excerpted from The Inspired Houseplant by permission of Sasquatch Books. 5 of 6 Photo courtesy Natasha Sidhu @la_sidhu. *(c) 2018 by Jen Stearns. All rights reserved. Excerpted from The Inspired Houseplant by permission of Sasquatch Books. 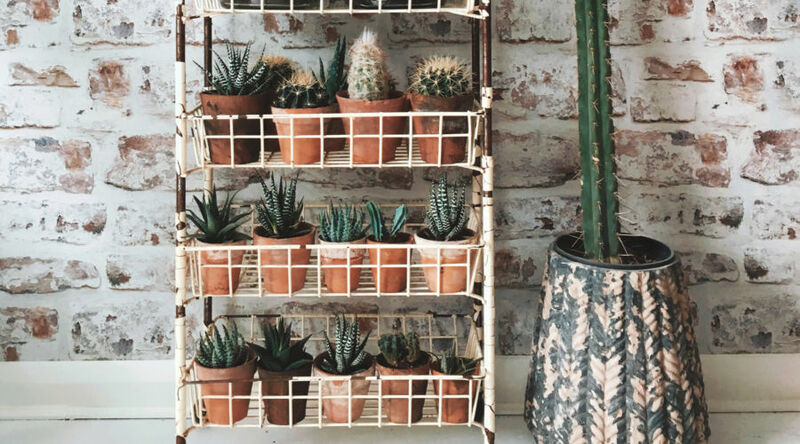 This antique rolling cart hosts an army of cacti and haworthia in uniform terra cotta pots, joined by feathers that ape stems and leaves sprouting from a vintage jar. The white-washed exposed brick and cactus housed in a snakeskin-look basket add rustic texture and interest. Photo courtesy Plant Shop Seattle. *(c) 2018 by Jen Stearns. All rights reserved. Excerpted from The Inspired Houseplant by permission of Sasquatch Books. 6 of 6 Photo courtesy Plant Shop Seattle. *(c) 2018 by Jen Stearns. All rights reserved. Excerpted from The Inspired Houseplant by permission of Sasquatch Books. A mix of plant types and containers create an enticing green corner. A vintage bar cart plays host to varied plant forms on two levels beneath a showpiece painting. Choose a bare space in your own home and then incorporate plants with many textures in containers of varied shapes and sizes. Rethink the table trope and reuse existing furniture pieces to showcase the plants. Incorporate paintings or sculpture to pull the look together.